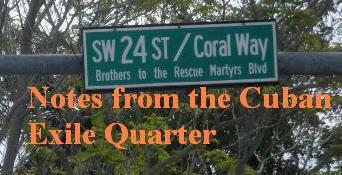 Notes from the Cuban Exile Quarter: Down with Cuban Imperialism in Latin America. Down with Cuban Imperialism in Latin America. The Cuban dictatorship beginning in 1959 had strategic designs on taking over Venezuela to exploit its natural resources in order to magnify its regional impact. On January 23, 1963 Cuban Communist leader Blas Roca made it public when he told a Havana rally that when the communists gained full control in Venezuela and they “make themselves owners of the great riches in oil, aluminum and everything their earth imprisons, then all of America shall burn.” A cache of three tons of weapons was found on a Venezuelan beach in November 1963 that was to be used to disrupt the democratic elections there. Fidel Castro would continue to agitate for revolution in Venezuela. A well documented incident occurred on May 8, 1967 and was reported in The Washington Post that described how: "two small boats carrying a dozen heavily armed fighters made landfall near Machurucuto, a tiny fishing village 100 miles east of the Venezuelan capital, Caracas. Their plan was to march inland and recruit Venezuelan peasants to the cause of socialist revolution." An all night gun battle with the Venezuelan military led to nine guerrillas dead, two captured, and one who had escaped. Venezuelans successfully defended themselves from repeated ventures, and the Castro regime relented pledging not to attempt the violent overthrow of the democracy, but years later they succeeded with Hugo Chavez at the ballot box what they had failed to do through force of arms. The Castro regime turned Venezuela into their colony. Caracas Chronicles is right when it observes: "Amazing how everything the left accuses the U.S. of wanting to do in Venezuela —siphon off oil wealth, install a puppet dictator, run hundreds of spies, crush democratic institutions— is stuff Cuba is *actually* doing. And has been. For years." Thousands of Cuban military advisers and intelligence officials assisted the Chavez and Maduro regime's consolidate power to entrench the dictatorship in Venezuela. OAS Secretary General Luis Almagro has described it as "being like an occupation army." The Castro regime's personnel have been training the military, security services and pro-regime militias in tactics and strategies to terrorize and repress the citizenry in Venezuela. Many young Venezuelans have paid the ultimate price for standing up for freedom in their homeland. 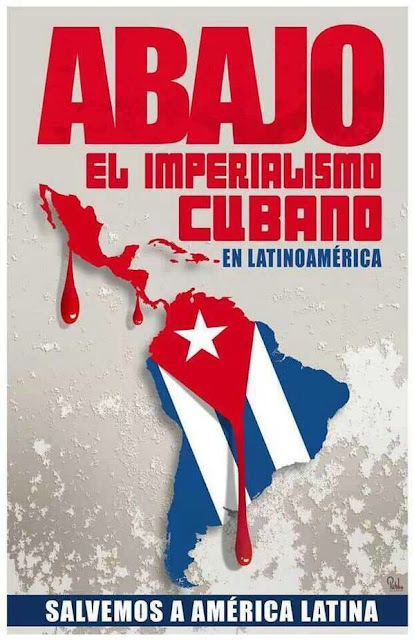 Time for the international community to assist in dismantling Cuban imperialism in Latin America. You are absolutely right that Fidel Castro wreaked mayhem in LatAm by attempting to export communism to the region because he saw Cuba as a role model for the developing world, since he saw himself as a Caribbean David in a persistent struggle against the Yankee Goliath, just as Hitler wreaked mayhem in mainland Europe by conquering the continent and killing millions of Jews and other supposedly inferior peoples, which is why some Cubans in Miami find the Hitler-Castro analogy appropriate. However, there is no Cuban imperialist project underway because Castro gave up armed Marxist revolution in the Americas in the 1990s and Maduro's predecessor was democratically elected, as was Daniel Ortega in 2006, without Cuban intervention, even though Chavez, Maduro, and Ortega all came to view Fidel Castro and Che Guevara as humanists and not monsters. "Now, the ways to get to power: can elections be a way?" Yes, we recognize it, if conditions, as occurred in Venezuela, allowed it, what we do not accept is the idea that people can only go on the path of elections in their struggle to reach power, and in that sense the Cuban Revolution claims the right of peoples to all forms of revolutionary struggle and popular mobilization against neoliberalism, against exploitation and underdevelopment. Source: Conference of the Minister of Foreign Affairs of Cuba at the "Teresa Carreño" theater in Caracas, on August 11, 2005, during the World Festival of Youth and Students. "Ahora bien, las vías para llegar al poder: ¿Pueden ser las elecciones una vía? Sí, lo reconocemos, si las condiciones, como ocurrió en Venezuela, lo permitieron; lo que no aceptamos es la idea de que los pueblos solo pueden ir por el camino de las elecciones en su lucha para llegar al poder , y en ese sentido la Revolución Cubana reivindica el derecho de los pueblos a todas las formas de lucha revolucionaria y a la movilización popular contra el neoliberalismo, contra la explotación y el subdesarrollo . Fuente: Conferencia del Ministro de Relaciones Exteriores de Cuba en el teatro “Teresa Carreño” de Caracas, el 11 de agosto de 2005, durante el Festival Mundial de la Juventud y los Estudiantes.